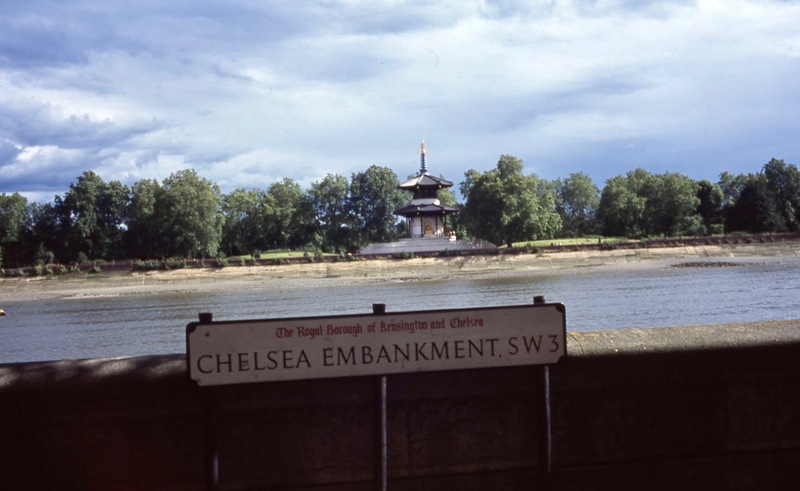 Today I scanned a dozen colour slides dated May 2008 from my Streets of London series. Pelham Place is a street of Grade II* listed Georgian terraced houses in South Kensington, London, England. 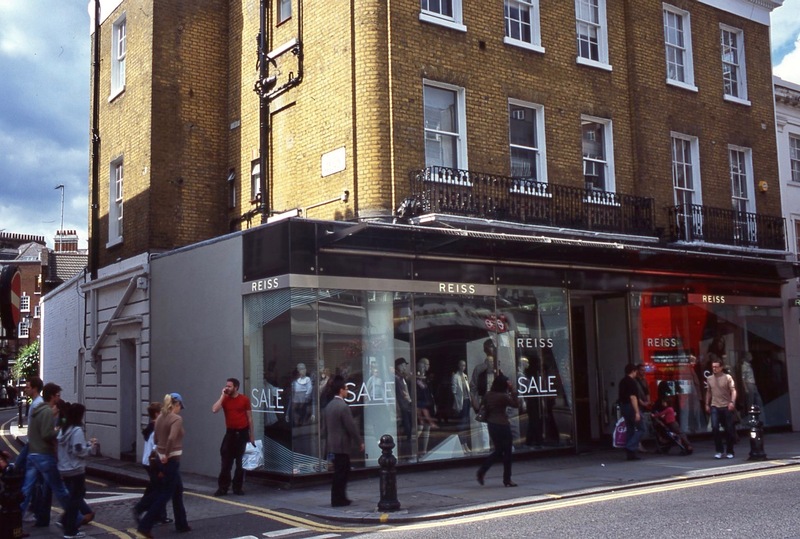 Pelham Place runs north to south from Pelham Place to Pelham Crescent. 2-14 is a circa 1825 terrace. 1-29 is an 1833 terrace, designed by the architect George Basevi. 1-29 is similarly grade II listed. In 1950, the British-born American winemaker Peter Newton met his future wife, Anne St. Aubyn at a party in his house in Pelham Place. 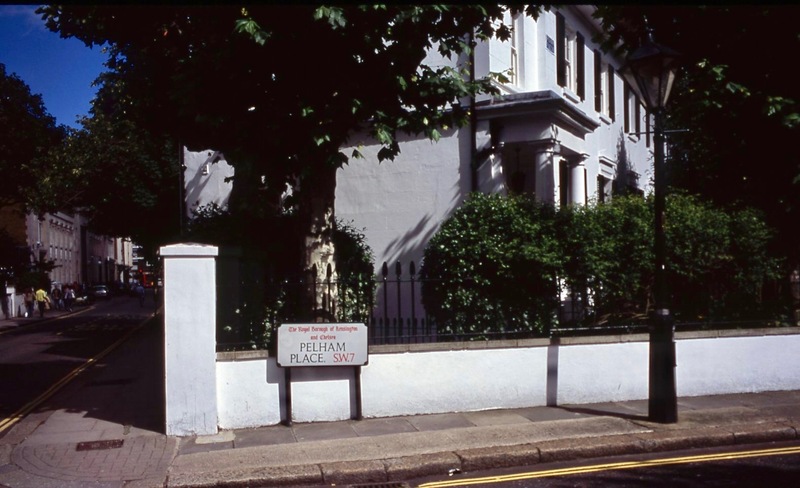 Mel Brooks briefly lived in Pelham Place in the 1950s, while working at the BBC on the Sid Caesar show. 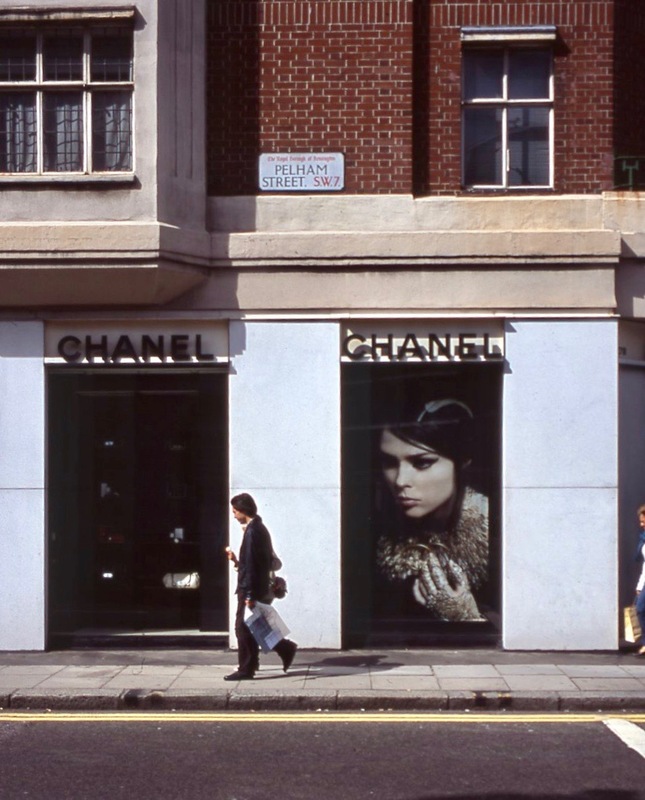 A couple of years after I photographed this Chanel Store in Pelham Street, the Swedish fashion store rejoicing in the delightful name of Acne moved in next door. And Chanel is still there! 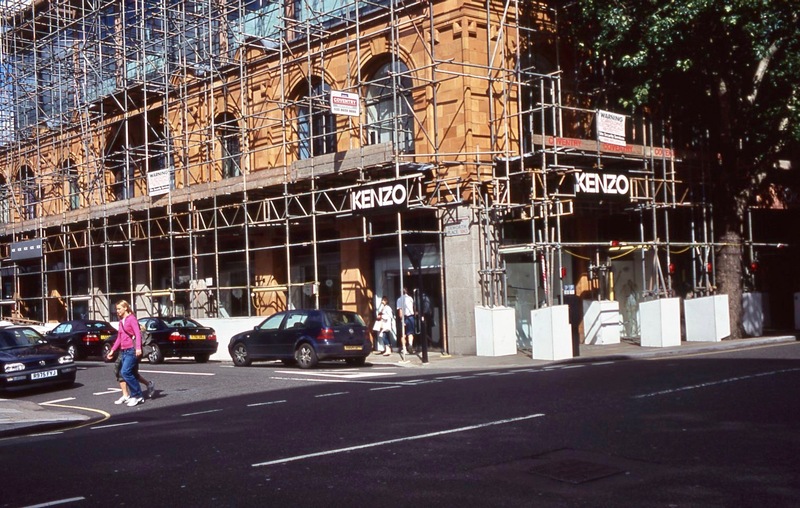 Kenzo, on the other hand, no longer seems to be resident in Ixworth Place, SW3. Perhaps the scaffolding drove them away. Strong sunshine has burnt out the name of the street sharing this corner of King’s Road, Chelsea, where the mens’s and women’s clothing chain was having a sale. 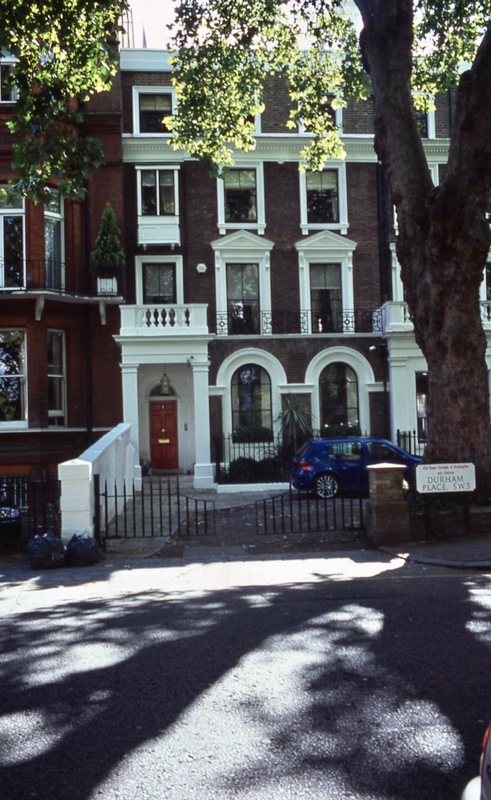 You would need a few million pounds to buy one of these houses in Durham Place SW3. 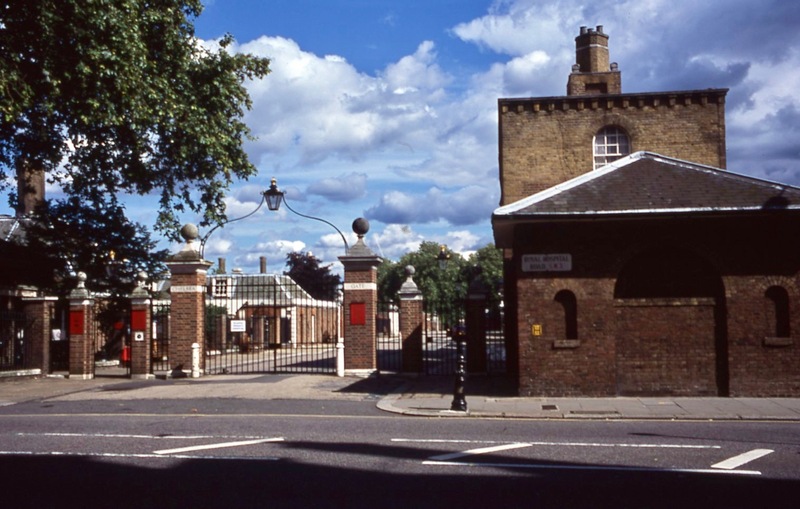 Wikipedia tells us that ‘The Royal Hospital Chelsea is a retirement home and nursing home for some 300 veterans of the British Army. 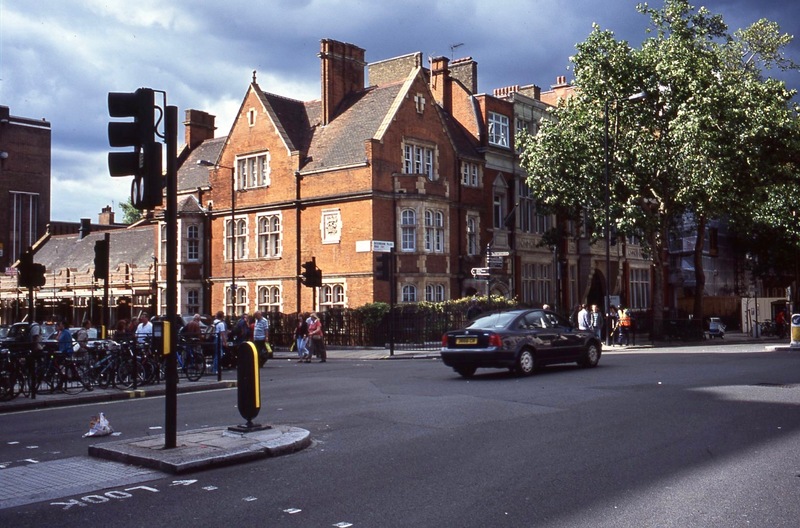 It is a 66-acre site located on Royal Hospital Roadin Chelsea, London. It is an independent charity and relies partly upon donations to cover day-to-day running costs to provide care and accommodation for veterans. 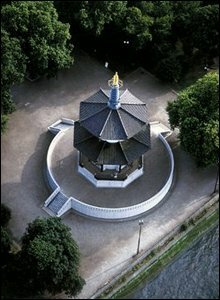 ‘At a time when the Cold War and the fear of a nuclear attack were escalating the offer of a Peace Pagoda to promote world harmony seemed appropriate. 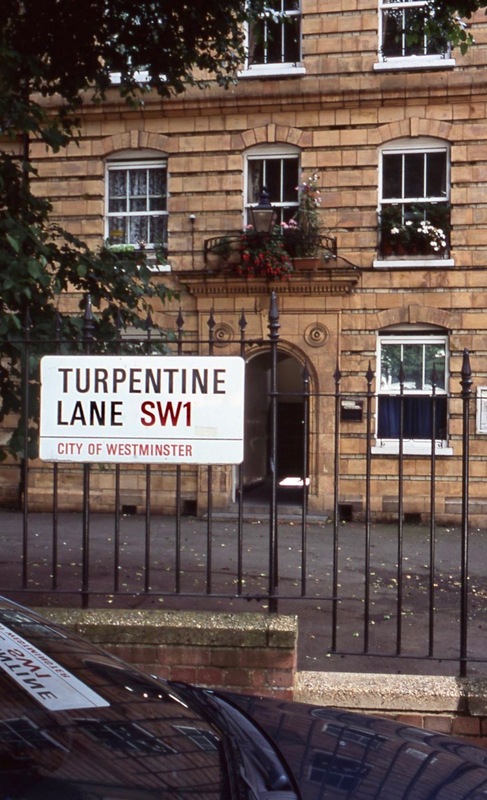 Turpentine Lane and Peabody Avenue SW1 lie in the Peabody Trust’s Pimlico Estate. ‘The White Ferry House brings a traditional country pub vibe to the centre of London. 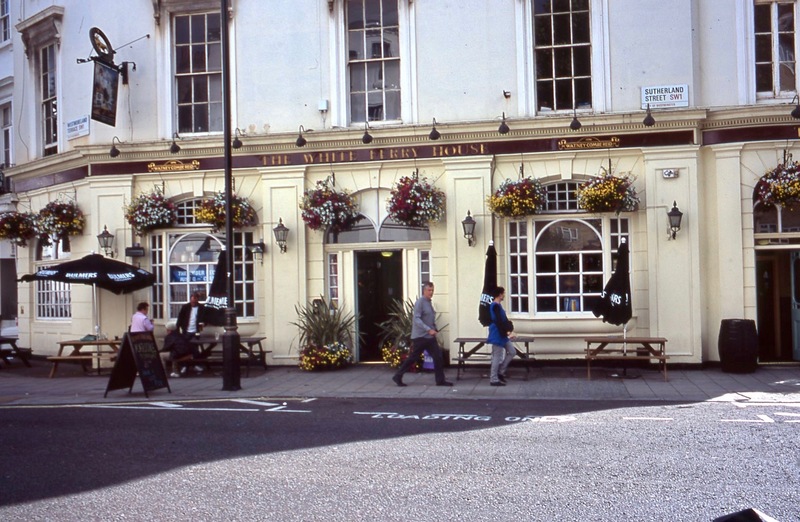 The venue is housed in a stunning Victorian ‘flat-iron’ building and comes steeped in history, with a network of passages historically used to smuggle baccy, rum and gunpowder to the river buried below its foundations.’ It stands on the corner of Sutherland Street and Westmoreland Terrace SW1. 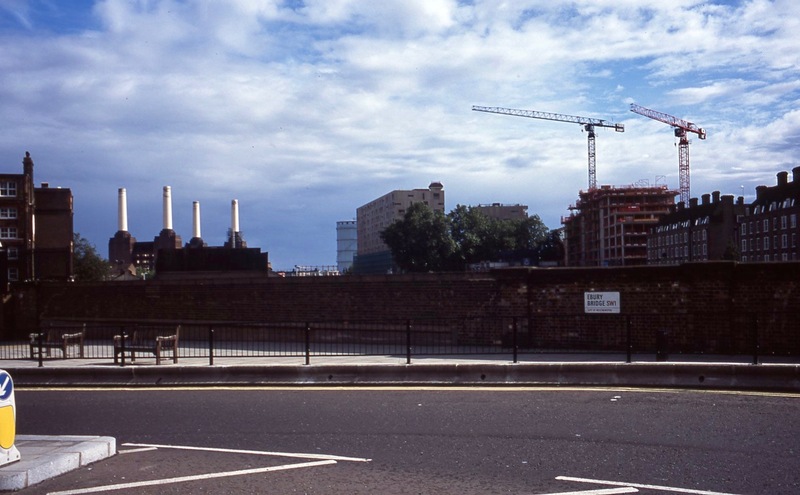 the iconic Battersea Power Station, visible across the river from Ebury Bridge SW1, now has a quite different purpose than originally envisaged. Buckingham Palace Road SW1 runs from the South side of Buckingham Palace towards Chelsea. This evening we dined on Jackie’s tender heart casserole topped with sauté potatoes; creamy mashed potato; sage and onion stuffing; roasted butternut squash, yellow peppers, and vary-coloured carrots; with crisp cabbage. The Culinary Queen drank Hoegaarden and Elizabeth and I drank more of the Rioja. This entry was posted in Uncategorized and tagged Battersea Power Station, Chanel, Chelsea Embankment, Durham Place, Ebury Bridge, Ixworth Place, King's Road, Peace Pagoda, Pelham Place, Pelham Street, Reiss, Royal Hospital Chelsea, The Peabody Trust, The White Ferry House, Turpentine Lane by derrickjknight. Bookmark the permalink. Another fascinating London tour. Thank you, Derrick. I think we need more peace pagodas. That giant lady staring out of Chanel looks anything but amiable. Interesting area. I suppose (having thoroughly enjoyed one after supper) Chelsea doesn’t really offer Chelsea buns? That doesn’t sound too much like the Chelsea Buns we have always bought here. They do feature raisins, though, and are coated with delicious white icing. Dear heaven ‘Acne’ – Coco would be turning in her grave! 🙂 Love the Peace Pagoda – the world most certainly needs more of those! I had to Google Peace Pagoda right away. The US only has four, according to my source. And it shows. I hadn’t thought to do that – so I did. It looks like there may be just two here – one in each island. You could do what I did – as soon as my Persian Tiles was finished I started another one for a Christmas present 🙂 They are a bit addictive…..
That other reply was not meant for you – my fingers are being particularly clumsy this evening. Sorry. That was quite a lovely tour, Derrick, thanks. Thanks for the excellent tour! Thanks a lot, Andrew. Great film. 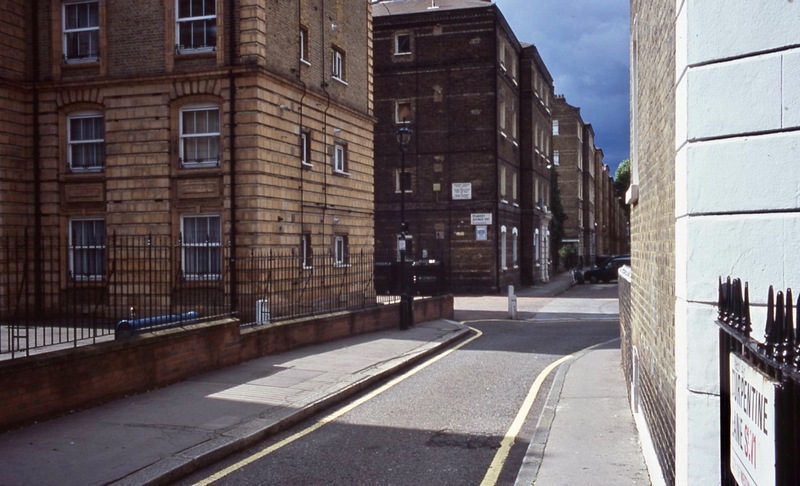 I lived in Pimlico for a year in 1973. Lovely old neighborhoods. And what a feast! You’re a fantastic tour guide, Derrick! Very interesting as ever; great pictures of a place I have never been to and likely will never get to…thanks! Thanks for the wonderful tour Derrick! Beautiful lighting and framing go hand in hand with illustrious diction. Many of those images trigger trains of thoughts, even though those places are thousands of miles away in distance and time. Thanks for the great Pics and tour in and around the Streets of London. Enjoyed it very much and found the old Royal Hospital Chelsea now used as a retirement home for some Veterans of the British Army to be particularly interesting, especially with my military background. Well, after all these years, now I know what a Chelsea Pensioner is. I had quite the wrong idea. If we promise to behave will you take us rambling with you, again, some day?!?! HUGS for you and Jackie and Elizabeth and your Mum! Thanks for posting these lovely photos of London Derrick! A lovely historical walk. Thank you. That house is my dream house. I have had to put it inside me. Fabulous post Derrick. Those ten yearly census reports have been a great source of information for my genealogical hunting. Great photos and interesting facts. I always like your tours of London.